While these giant clams will add a bright splash of colors to any reef tank, their ability to filter out nutrients in the water column is often overlooked. 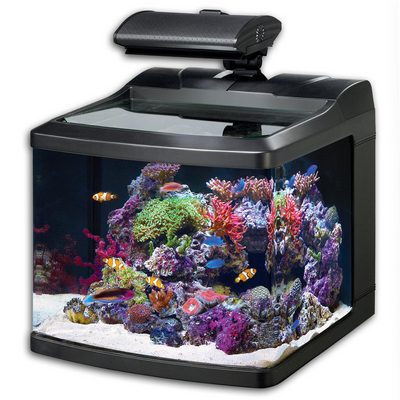 As any hobbyist knows, nutrients in an enclosed reef tank tend to build up over time and become a concern even at pretty low levels. These nutrients, if left unchecked, may lead to problems with various forms of nuisance algae, cyanobacteria, and less then optimal health amongst reef tank inhabitants. These giant clams actually remove nitrates and ammonia from the water column, and can lead to better water parameters. Giant clams achieve this by continuously circulating water through their internal organs and consuming nutrients and plankton. Along with zooxanthellae within their syphonal mantle (the fleshy, colorful part of the clam), Giant clams use these nutrients to assist in the photosynthetic process. 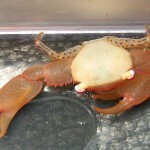 The major advantage a clam has over other biological filtration is that it removes the ammonia BEFORE it is allowed to enter the nitrogen cycle, and therefore prevents nitrates from being formed. This action results in lowered nitrates and bioload. Naturally, we do not suggest attempting to use these clams as your main form of filtration. 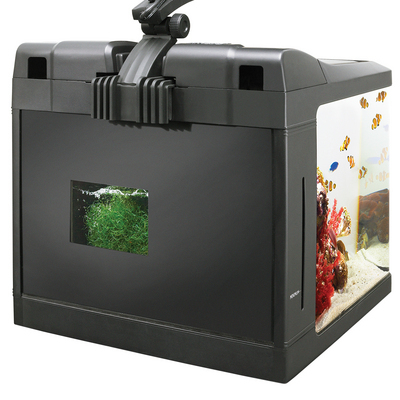 The use of a refugium, protein skimmer, as well as chemicals is recommended in assisting any hobbyist with their goal of excellent water parameters. 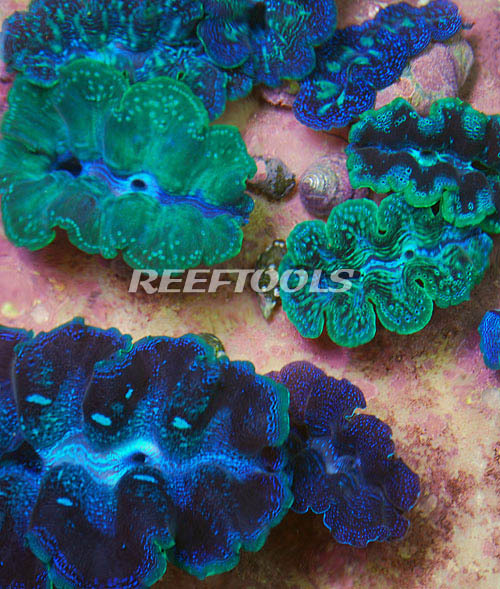 However, these giant clams can certainly increase both stability and biodiversity in your reef tank. 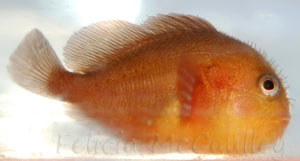 Some of my all-time favorite fish are fish in the genus Caracanthus. 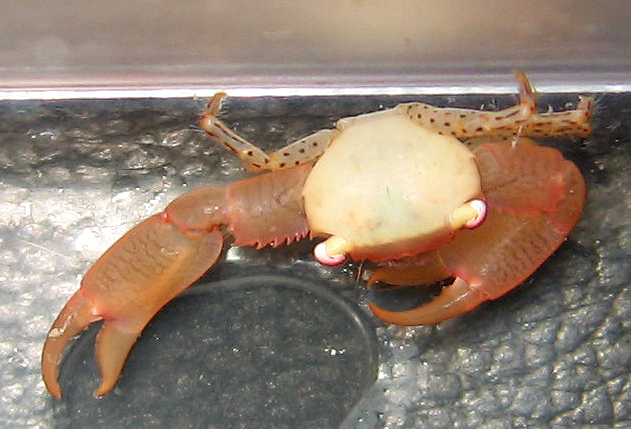 There are four species in this genus, though only two are common in the pet trade — Caracanthus maculatus from the Indo Pacific and Caracanthus madagascariensis from Africa. Some common names for these fish are Velvetfish, Velvet Goby, or Gumdrop Coral Croucher. Velvetfish are often called gobies, but they actually belong to the order Scorpaeniformes like scorpionfish and anglers. The specimens from Africa are the most colorful, having pink bodies and red spots to resemble the Pocilloporid corals they inhabit. These tiny fish only grow to about 2.5 inches max. They are clumsy swimmers and prefer to perch or squeeze themselves into tight spaces, holding on with their thick pectoral fins. Velvetfish have vertically flattened bodies so that they can squeeze into the branches of Pocillopora, Stylophora, Acropora, and similar corals. If you have large, healthy colonies of these corals in your aquarium, they shouldn’t be harmed by the activities of these fish. If you keep a breeding pair, however, you may notice some tissue loss on the underside of a coral where the Velvetfish lay their eggs. Velvetfish are venomous, so use caution when cleaning their tank. As long as you don’t pick one up and squeeze it, you shouldn’t get stung. The sting isn’t nearly as bad as their scorpionfish relatives and feels a lot like a bee sting. If you do get stung, immediately soak your hand in hot water (as hot as you can stand). Velvetfish can be aggressive toward their own kind, so they are best kept singly unless you find an established pair for sale. Otherwise, they are docile toward other fish. I kept my Velvetfish in a 55 gallon aquarium with many tiny gobies such as Trimma, Eviota, and clown gobies. My Velvetfish never showed aggression or interest in consuming any of my tiny gobies. When choosing a Velvetfish for the first time, make sure to choose a fish that is not too skinny. Their bellies should be rounded and not concave. 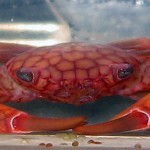 The head and dorsal area should also be full and not sunken in. Ask the pet shop to feed the fish in front of you so you are sure it is eating frozen foods. If the fish only eats live food, it might appear to be interested in the frozen food, only to spit the food out after tasting it. So be very observant and make sure the fish actually consumes the frozen food. It takes a lot of preparation to keep a Velvetfish who only eats live shrimp and has not been trained to eat frozen food. 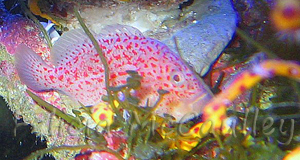 It can be difficult to feed these fish, especially in a larger aquarium where they have a lot of places to hide. They normally will only eat food that falls within an inch of their face, so target feeding is required. I would recommend keeping a new Velvetfish in a small, bare bottomed quarantine tank with one or two branching decorations for the fish to hide in. Then target feed the fish frozen food like Mysis with a syringe. There is a good chance the fish may not take to frozen food right away, even if it was eating it in the store. In this case you’ll have to buy tiny feeder shrimps until the fish learns to eat frozen food. Young freshwater ghost shrimps that have been enriched with vitamins and gut-loaded make a good live food. Velvetfish are considered cryptic fish and tend to hide almost constantly, especially at first. Once they become comfortable in an aquarium, they can become quite tame. My Velvetfish was not afraid of me and would actually watch me and follow me as I moved around the tank. 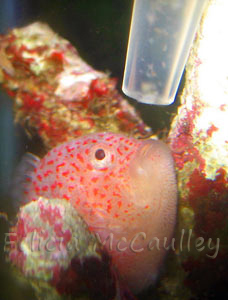 He ate directly from the tip of the feeding syringe and would even swim to it if it wasn’t nearby. 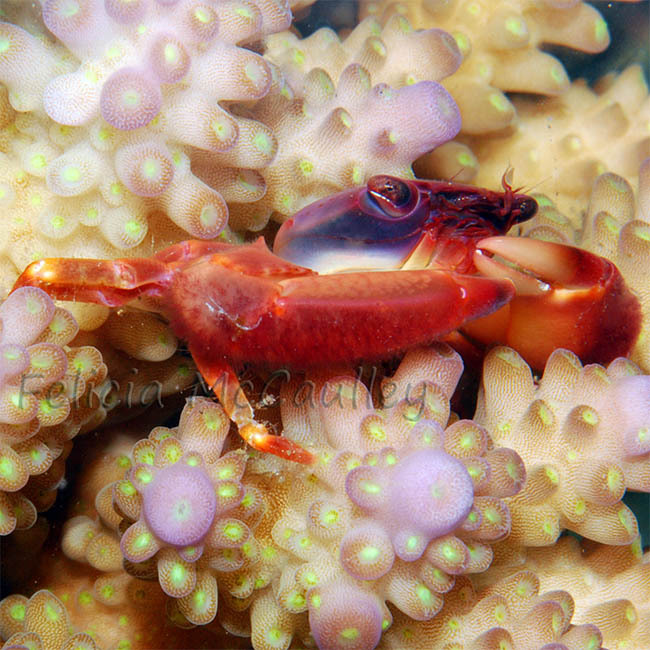 I was lucky enough to pick up a Pygmy Coral Croucher Caracanthus unipinna a couple months ago that arrived as a hitchhiker in an Acropora coral. This fish is tiny, about the size and color of a newly minted penny. It is so small, I have to keep it in a baby guppy box that hangs in the main tank. For the first couple weeks, I was target feeding it live amphipods from my aquarium, but it soon learned to eat small frozen mysis from the syringe. EcoTech Marine has just released a new Battery Backup. This new battery backup is produced in-house and ensures that EcoTech Marine has full control of availability and quality. 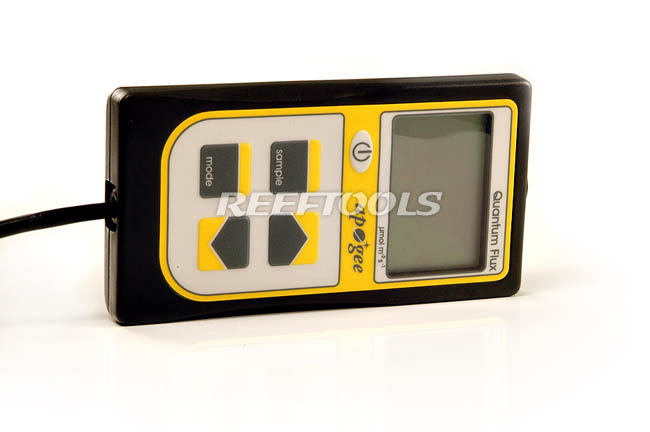 The new battery now comes with two cables allowing the user to backup multiple pumps, or chain multiple batteries together for longer run-time. 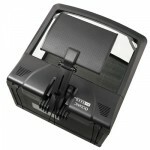 Along with a new and more powerful charger, this new battery looks to be a great addition to any VorTech setup. In our quest to continually raise the bar for product excellence and customer experience, EcoTech Marine is pleased to announce the release of the all new EcoTech Marine Battery BackupTM. 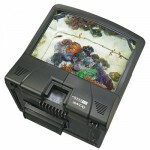 Thanks to our loyal and rapidly expanding customer base,EcoTech Marinecontinues to grow its product line. 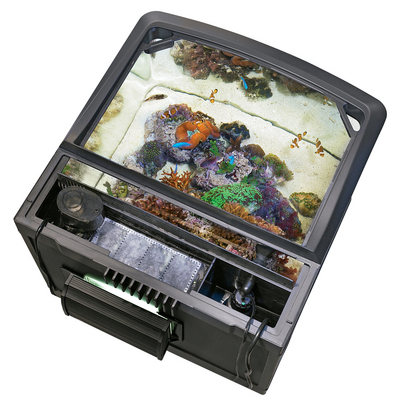 Expanding our product line and in-sourcing our production and quality control is a natural step for us to take and one we hope is embraced by the reefing community. 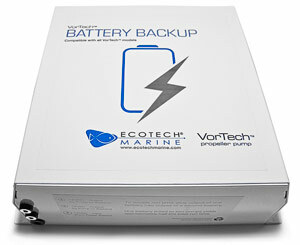 After an extensive period of engineering, the new EcoTech Marine Battery Backup is now shipping. 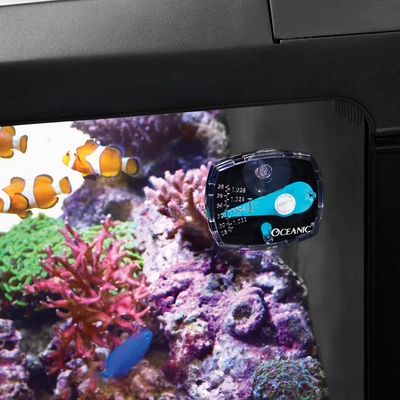 “By bringing the Battery Backup accessory in-house, we can now better control the availability and final quality of this critical piece of reef tank insurance,” said Tim Marks, President of EcoTech Marine. “We thank IceCap for their support over the years and are pleased to take this step forward.” The Battery Backup also now comes with two spare cables, instead of just one allowing you to backup multiple VorTech propeller pumps or link batteries together for more run time. Additionally, we are utilizing a more powerful charger which allows for longer run-time, all while keeping the price for this accessory at its current level of $165 USD. 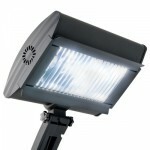 Look for it at on-line retailers and local shops now. Remember, it might take a typhoon to destroy a natural reef, but for our captive reefs it only takes a power outage. 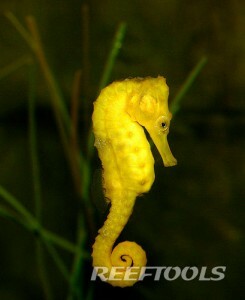 Seahorses used to be considered one of the most difficult sea creatures to keep in an aquarium. Wild caught seahorses were plagued with internal parasites, bacterial infections, and appetites for expensive live shrimp. 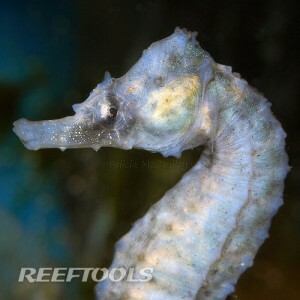 Advancements in technology and marine fish breeding have led to large populations of readily available captive bred seahorses, making it unnecessary to buy wild caught seahorses. Because of this, seahorses are no longer difficult to keep, as long as you follow basic seahorse care requirements. If you decide to keep seahorses as pets, it is important to find a supply of healthy stock. Check with the breeder to make sure the seahorses are bred indoors and not in ocean pens where they would be subjected to the same parasites and disease that wild caught seahorses would. Purchasing seahorses from a local breeder or an online company in your country will reduce travel time and stress. the Hippocampus erectus or Lined Seahorse is among the hardiest and easiest to keep of all medium-sized seahorses. They are native to the United States; most of the captive bred stock in the U.S. today is likely descended from Floridian ancestors. In this article, we’ll focus on Erectus seahorses. 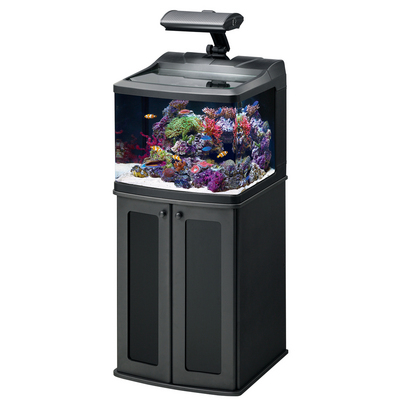 A 30 gallon aquarium is the minimum size for a single pair of Erectus seahorses. 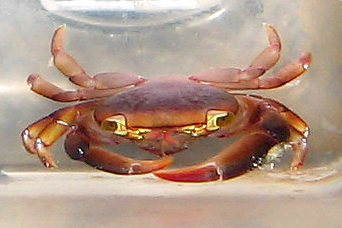 Two pairs may be kept in a 50 gallon aquarium. 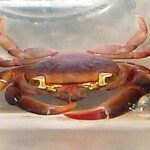 If breeding or courtship viewing is a goal, the tank should be at least 16 inches tall. 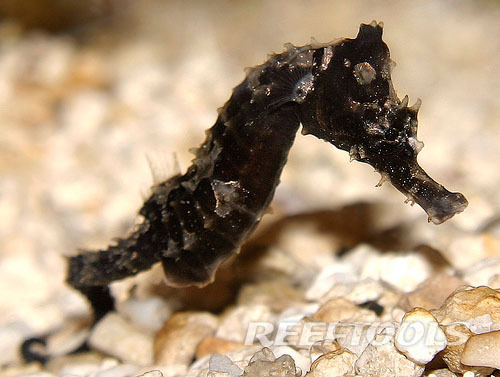 Seahorses need frequent meals of frozen mysis, at least twice a day. Live rock and macroalgae can help reduce nitrates and house tiny, nutritous crustaceans called Copepods and Amphipods for the seahorses to snack on between meals. A powerful filter will also help reduce nitrates. The most important piece of equipment on a seahorse aquarium is a chiller. Seahorses are sensitive to infections of the bacteria Vibrio spp. A protein in the Vibrio bacteria changes when the temperature rises above 74 degrees Farhenheit. The seahorses then have reduced immunity while the bacteria becomes more virulent, aggressive, and prolific. It’s a good idea to keep the aquarium temperature between 68 and 74 degrees for Erectus Seahorses. Raising the temperature for even a short time can open the door to an infection. Seahorse tank mates should be carefully considered. Large, aggressive fish like tangs, triggers, puffers, and lionfish are not safe with seahorses. Anemones, corals with stinging tentacles, brain corals, and crabs can be very dangerous to seahorses. 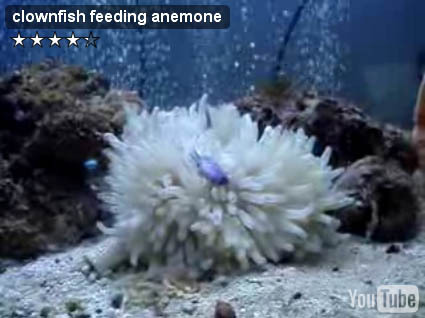 Use caution with clams which may pinch a seahorse’s tail, Cleaner Shrimps which can irritate a seahorse or be aggressive, and nuisance anemones such as Aiptasia and Majanos which can sting. Only the most peaceful, shy fish are safe to keep with seahorses. Tiny gobies, small Brotulids, Firefish, Pipefish, Mandarins, and Scooters are a few fish that are totally seahorse safe. Once your seahorses are fully grown and comfortable, Flasher Wrasses, small Anthias, Tilefish, and other small, peaceful fish may be added, but should be removed at the first sign of aggression or if the seahorse can’t get its share of food. Seahorses will try to wrap their tails around anything, including the impeller of a powerhead or a scorching hot heater. 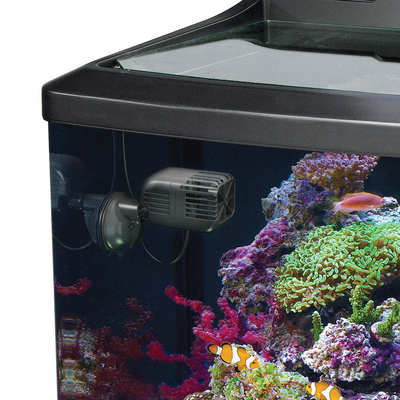 Avoid using open powerheads and heaters in a seahorse aquarium. A heater is unnecessary in all but the coldest climates. If you must put a heater in your seahorse aquarium, use a heater guard or put it in the sump away from seahorse tails. Although seahorses aren’t the best swimmers, they are tolerant of fast, gentle currents. Avoid powerheads that spray water in a tight jet and instead opt for spraybars and wide nozzles. Captive Bred seahorses that are well fed and cared for can live five years or more in captivity. They aren’t the weak, delicate creatures they were once thought to be and are actually quite sturdy and forgiving of minor water quality problems. Unlike wild caught seahorses, captive bred seahorses are accustomed to human interaction. They can become very tame, begging for food and hitching to the seahorse keeper’s fingers.